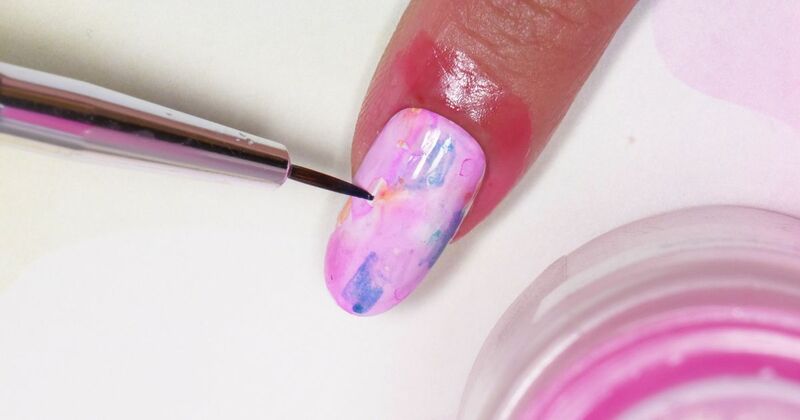 Watercolor nails are perfect for spring. The soft pastel colors go with most wardrobe selections, and they’re fun to paint because slight variations are part of their charm. If you love floral patterns, then adding a stamped design to the watercolor background makes it even more festive. The secret to creating beautiful watercolor nails is to use multicolored Sharpie pens and a bit of alcohol. You can draw the different colors on with the pens then blur the color with alcohol and a fine detail brush. After that, add the floral design of your choice, and you’ll have a pretty bouquet on every fingernail. 2. Apply latex tape peel off cuticle guard to the skin around the nails and let it dry. 3. Paint a second coat of white gel polish on to the nails and then cure them with the lamp. 4. Wipe the nails with a cotton pad soaked in alcohol. This will remove any tackiness from the gel. 5. Draw multicolored patches on each nail with the Sharpies. 6. Dip the fine detail brush in alcohol, then wipe the tip against the ink on the nails to create a watercolor finish. You may need to repeat this step several times to complete the effect. 7. Apply a single coat of soak off base gel to the nails, then cure them with the lamp. 8. 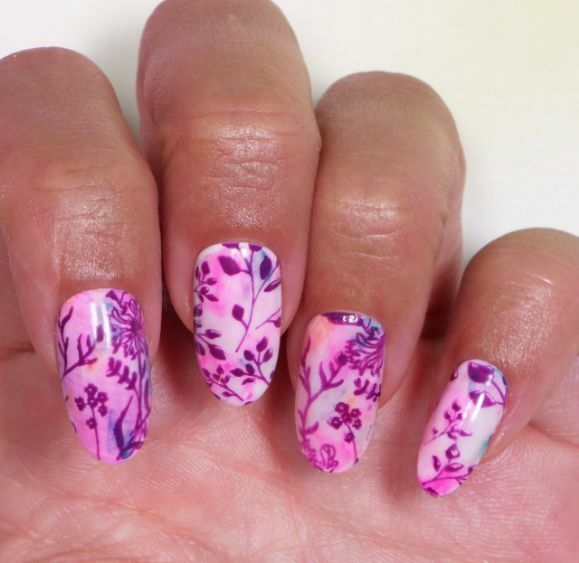 Use a toothpick to apply purple stamping gel to the edge of the stamping plate design. 9. Scrape the wet paint into the design, and then press the stamp against it to pick up the polish. 10. Stamp the design on the nail, and cure the polish once more. 11. Apply gel top coat and cure with the lamp. 12. Remove the cuticle guard with the tweezers. 13. Clean the stamping plate and scraper with an acetone-soaked cotton pad. 14. Clean the stamper by pressing it against the sticky tape on a lint remover tool.